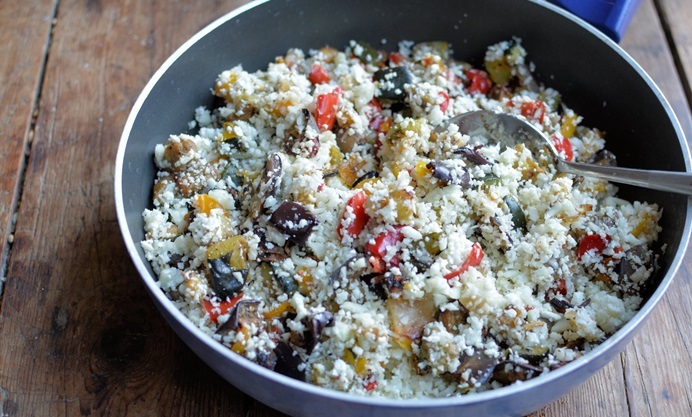 Full of spices and charred roasted vegetables, this Moroccan-style 'couscous' from Karen uses cauliflower for a low-carb version. 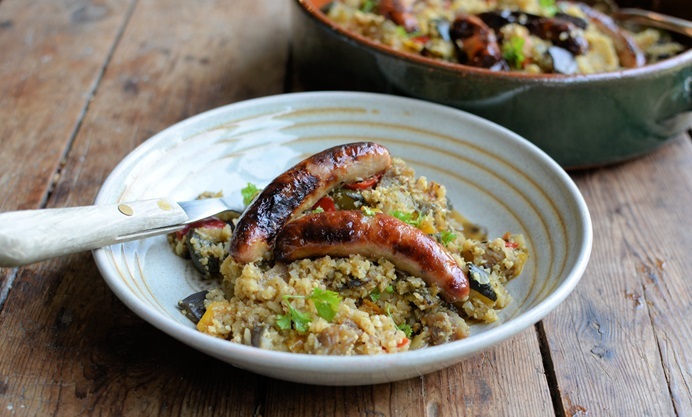 The cauliflower couscous can be topped with spicy sausages as Karen does here, or with other grilled meats or with halloumi or feta for a veggie version. I am always trying to ‘watch my weight’ as the saying goes, especially in January after the excesses of the festive period… luckily, I find it very easy to cut back on calories and also add more of my ‘five-a-day’ to my diet with the humble cauliflower. Cauliflowers have been much maligned in the past, and the only way you’d see them on the dinner table was when they were robed in a cheese sauce, which I do love; but, they can be used in so many more recipes than that, and this recipe for cauliflower couscous is just one example of how this versatile veg can come into its own. 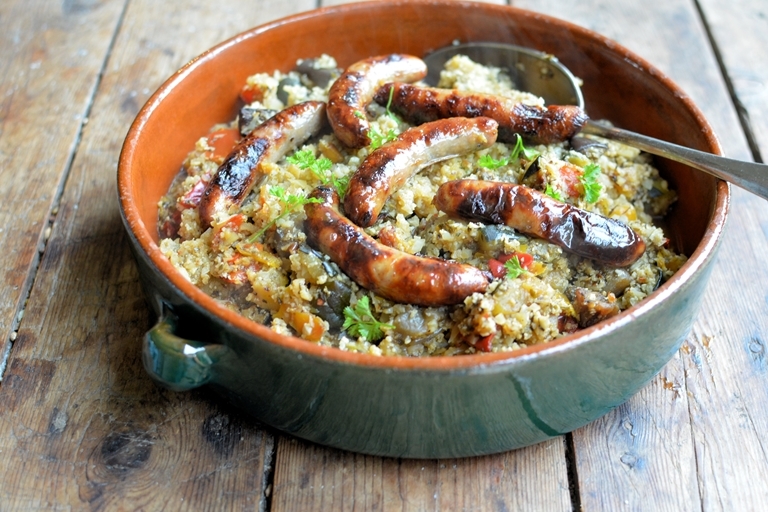 This is one of my most popular recipes, I make it several times a month and add all sorts of bits and bobs to the basic cauliflower couscous; from halloumi cheese and roasted vegetables to spicy sausages and chicken kebabs, it’s always welcome as a healthy lunch or supper dish, even by my husband whose dislike of cauliflower is well-known in our household! 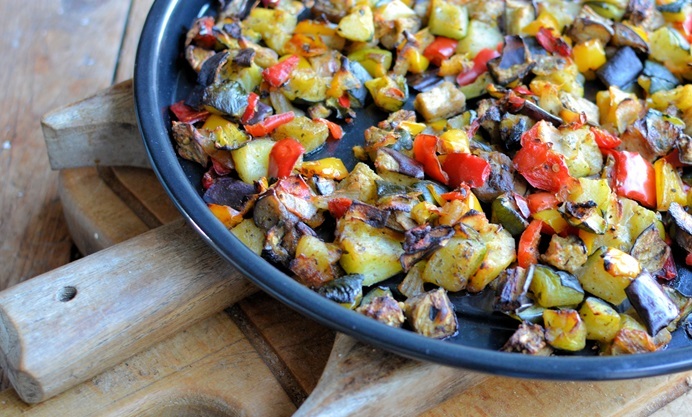 This recipe uses cauliflower as a base for Moroccan-style roasted vegetables and Merguez sausages, and is absolutely delicious. 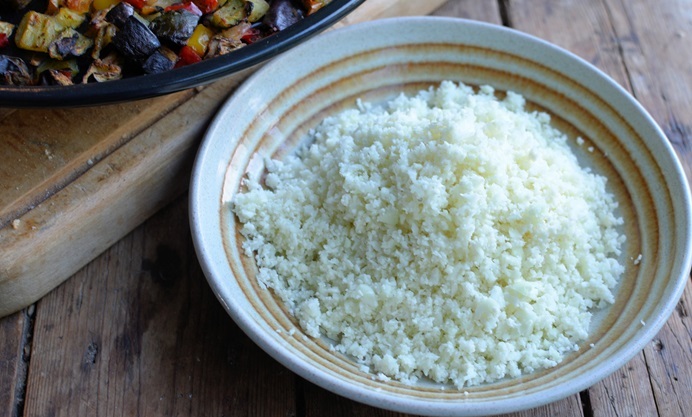 The cauliflower ‘grains’ replicate the texture of couscous so well, it’s hard to tell that you are eating a vegetable and not the normal cereal. This recipe joins the canon of tried and tested cauliflower recipes that I have developed and made in the past, such as cauliflower steaks, whole roasted cauliflower, cauliflower mash and cauliflower pizza, and I hope that you will enjoy this meal as much as we always do when I make and serve it. If you a vegetarian, than just omit the sausages and use grilled halloumi cheese, or even Quorn sausages. And, if you cannot source Merguez sausages, then just use any sausages of your choice.